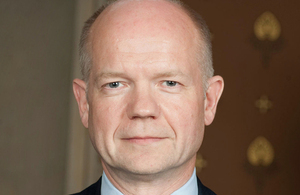 Below is the text of the speech made by William Hague, the then Foreign Secretary, at the Somali Diaspora reception in London on 23 February 2012. It is a great pleasure to welcome you to Lancaster House ahead of the London Somalia Conference. I know many of you have travelled a long way to be here. I have just met the delegation from Wales – they are particularly welcome, as my wife is keen for me to note – but also from all over the United Kingdom and from Somalia itself. Wherever you have come from, you are very welcome. Tomorrow the largest gathering of countries and organisations ever to come together to discuss Somalia will meet in this very room. The conference will include the President and Prime Minister of Somalia, the President of Somaliland, seven Somali delegations, leaders from across Africa, the Secretary General of the Union Nations, and many Foreign Ministers from around the world. Our Prime Minister initiated this conference because Somalia matters greatly to the United Kingdom; and the involvement of all these nations and organisations confirms that Somalia’s stability and security matter to the whole world. And there are just three things that I want to tell about tomorrow’s conference. The first is that it is not about imposing a solution on the people of Somalia. Only they can determine their future and we cannot make their decisions for them. As the Prime Minister said this week, the aim of the conference is to try “to get the whole of the world behind the efforts of the Somali people who are building a stronger, safer and more prosperous country”. Somalis in Somalia and around the world are at the forefront of our minds as we host this conference. They have endured twenty years of conflict, suffering, deprivation, violence and hunger – but show the most remarkable resilience, courage and love for their country in their determination to rebuild Somalia. I met some of them when I visited Mogadishu three weeks ago, and I pay tribute to them and to all of you here tonight who support Somalia in many different ways. As I pointed out to the House of Commons when we debated this issue ten days ago, the amount of money that Somali people around the world send back to their country is greater than all the international aid from all the countries of the world that the country receives each year, which is a striking illustration of that bond and that commitment. And I believe that, if a country’s greatest asset it its people, then Somalia can consider itself rich indeed. You are all here tonight as representatives of the Somali people, and we have done our utmost to speak to members of the Somalia diaspora here in Britain and overseas as we prepared the strategy that we will discuss tomorrow. From Cape Town, where I was last week, and in Nairobi before that to Birmingham and Bristol we have held events for British Ministers to meet Somali community groups, and on Monday the Prime Minister hosted a gathering in Number Ten Downing Street for the same purpose. I thank Chatham House and the Council of Somali Organisations for their part in supporting these discussions, which really have made a contribution to our thinking and our policy. The second thing I want to tell you is that we believe it really is a historic moment of opportunity for Somalia – and we hope you share the same sense of optimism, despite the immense challenges that are still ahead. The fact that I was able to be the first British Foreign Secretary to visit Somalia in twenty years was because of the success African Union Forces and Somali leaders have had in regaining control of Mogadishu and restoring authority in different parts of Somalia. There is an opportunity this summer to forge a more representative political process for the people of Somalia, and to provide more of the development and regional support that the country needs. Now really is the time for us to seize that moment of opportunity and to coordinate international assistance in meaningful ways behind Somali efforts, and that is what I believe all the countries gathered here in London are determined to do. And I hope that what we have done will give you confidence. I was proud when I visited Mogadishu to do so with our new Ambassador to Somalia for twenty years. And I dug for myself the first hole in the ground where our new Embassy will stand. And my third message to you is that this really is an important priority for our Government. We know that what happens in Somalia has consequences for the entire region and the whole world. Hundreds of thousands of refugees remain encamped in neighbouring countries. Two decades of chronic insecurity have created in some places a breeding ground for piracy and terrorism which has a direct impact on our own national security here. Sailors from around the world have been kidnapped from the Gulf of Aden and Indian Ocean. Citizens from Europe and North America have been taken from Kenyan territory and held to ransom. And the terrorist tactics of Al Shabaab are a direct threat to our own security and to many other people around the world, as well as a source of suffering for Somalis. We are serious about working with others to help Somalia get back onto its feet, and we will maintain that commitment over the coming years. We are also joined this evening by a large number of British Members of Parliament from all Parties including members of the All Party Parliamentary Group and the Foreign Affairs Select Committee, who I thank for their longstanding interest in this area. They are proof of the fact that the people of Somalia have a strong friend in the United Kingdom, and many people who have supported it through thick and thin and will continue to do so in the future. So tomorrow we hope to agree with our partners a more coherent, and better coordinated, international strategy for Somalia: including action to support the political process, to help eradicate piracy, to support human rights, justice and development and to help the recovery of Somalia.